Last week, I had the privilege of presenting my research to His Holiness the Dalai Lama. My presentation was part of a panel in which scholars talked about the world’s big problems. Each of us spoke about what research in our field said about one of those problems, including what we could do to improve the situation. Naturally, I talked about jobs—bad jobs. We spend most of our waking hours either at work or thinking about our work. We are often defined by our work, identified by it. When our work gives us meaning and dignity, we feel fulfilled. We are happier. When we are happier, society is healthier. But according to the International Labor Organization, more than 900 million people in the world have jobs that do not provide a living wage, let alone dignity and meaning. They have bad jobs. Then I went on to describe bad jobs in the retail industry in the U.S. I started with low wages. A typical full-time cashier or salesperson who works 40 hours a week—which is supposed to be the definition of a full-time job—does not earn enough money to take care of a family of four. If he or she is the sole breadwinner in the family, that family will be below the poverty threshold. And by the way, even so-called “full-time employees” in retail are not actually guaranteed 40 hours a week of work (and pay) because 94% of retailers consider anyone who works more than 32 hours to be a full-timer. So their income can vary by as much as eight hours of pay from week to week. From work hours and pay, I moved on to work schedules. You might think that it doesn’t matter so much when the hours are as long as there are enough. If so, you haven’t worked in retail. Schedules can be all over the map; they change all the time and the workers only find out one or two weeks in advance. I showed the Dalai Lama the schedule of a full-time employee I recently interviewed. Let’s call her Jane to protect her privacy. Jane is not even at the bottom of the heap; she’s a manager. She handles customer problems, equipment problems, and employee problems. But Jane is an hourly manager and her schedule looks different every single week. Here’s what her schedule looked like for one particular week. You can see that, on Wednesday night, she worked from 5pm to 9pm, but the next morning, her shift began at 5am. She lives about an hour from the store, so that leaves her 6 hours to eat, sleep, get ready to go to work again. Not to mention details like trying to wind down from work so she can get to sleep. And she’s in her fifties. Imagine having a life or taking care of a young family when your schedule changes like this every single week! The Dalai Lama doesn’t exactly work a 9-to-5 day, either, but I could tell that he was surprised and perhaps even upset. There were many problems that he probably already knew about coming into the panel. From the questions he asked, it was clear that he knew about climate change, hunger, and inequality in the world. But I think he was really surprised to see that jobs could look like this for millions of people, even in a developed country. He told me, “There should be an organization to look after these workers.” He was thinking of unions. He’s right. It’s unreasonable for workers to be treated this way. It’s unreasonable for companies to operate this way, especially when we know that it is possible and highly profitable to operate differently (see my HBR piece on this). At a minimum, we can do something as customers. When either of two stores or either of two restaurants has what you want at the price you want it, why not choose the one that treats its employees better? When customers care, companies may also start caring. Our politicians can certainly play a role. When they speak about the need for more jobs, they can start mentioning not just more jobs in terms of quantity but also better jobs in terms of quality. We don’t just need more high-tech jobs and fewer retail jobs. We need more jobs of any kind, which pay a living wage and give a person a sense of doing something worth doing—which can easily be retail. Politicians can’t solve this problem themselves, but they can acknowledge it and encourage companies to offer better jobs. Thought leaders like the Dalai Lama can play a role: They have a chance to communicate the message to business leaders, often with a lot of media and other people looking on. And if they want to know how companies can do better—if that’s really true or just wishful thinking—I am happy to send them my papers and case studies (and certainly my book to be published next fall!). And professors, like me, who teach future managers, can play a role. In addition to teaching our students tools and techniques, we can start teaching them how to use those tools in a meaningful way. We can remind them that there are different ways to make money. Some ways are good just for companies and some ways are more sustainable in that they are good for companies, their employees, and society. We can encourage our students to take the better way and teach them how to get there. Patty finds meaning and dignity in her work and she is paid well, has good benefits, and doesn’t have to juggle a schedule that would drive anyone crazy. In The Wal-Mart Way, former vice chairman and COO Don Soderquist makes a point of how important little things such as having greeters can be for customer service. “The Wal-Mart organizational culture begins with a positive can-do attitude,” he writes, “which welcomes our customers at the front door in the person of a greeter.” Indeed, it’s often the case that the greeter is the only WalMart employee customers actually talk to. So it seemed ominous to me when WalMart recently decided to reassign the greeters to other tasks during the day shift and eliminate them altogether from the night shift. A lot of other industry observers also disapproved, predicting that WalMart was sacrificing the personalization of the customer experience and might also suffer from greater shrinkage. Some argued that greeters, who are often older employees, may not work out that well in other tasks. I immediately suspected that the elimination of greeters is part of something bigger. To me, it is a sign that WalMart, like many other retailers, is operating in what I call a vicious cycle (see my recent Harvard Business Review article that describes the vicious cycle of retailing in detail) and that things are therefore getting worse for the company. Let me explain the vicious cycle using Borders as an example. As my older son says, Borders is unfortunately not with us anymore. The company went bankrupt last year. Obviously, many things contributed to the bankruptcy. Bookselling is a tough industry with many trends operating against brick-and-mortar retailers, including the emergence of Amazon during late 1990s, the popularity of digital music, and then the rise of electronic books. But still, Borders didn’t have to be the first book retailer to disappear. In fact, Borders used to be a great company, especially during the 1990s. I say that without hesitation because I did a lot of research there. But then things started changing and the company lost its way. I could write a long article on all the things the company could have done differently to survive, but keeping to the subject—WalMart’s greeters—let me focus on a few mistakes Borders did in managing store employees. Borders stores used to be quite profitable and store employees were a part of that. Not surprisingly, Borders used to have better labor practices than a lot of other retailers—better selection of employees, more training, and so on. But when things started getting tough and Borders management was under pressure to cut costs, one of their first moves was to cut labor costs at the stores. It started with increasing the percentage of part-timers and cutting down on employee hours. I analyzed four years of Borders data, from 1999 to 2002, and found that the stores were on average understaffed—there simply weren’t enough employees to get all the work done. In fact, my analysis showed that the company would have made higher profits if it had kept more employees working at the stores. Understaffing then led to operational problems. At some stores, boxes of new books just sat in the backroom for weeks because there weren’t enough employees to shelve them. Thousands of books that were supposed to be replenished from storage locations just sat in storage for a long time. Books that were supposed to be returned to publishers were not pulled from the shelves. This cycle is not specific to Borders; most retailers suffer from it. But then something else happened at Borders. When things got worse, Borders eliminated “community relations coordinators” from many of its stores. What did community relations coordinators do? The short description for this job title was: “Responsible for creating and maintaining strong ties in the market for the purpose of creating a community presence and to increase our customer base.” Community relations coordinators localized the stores and made them part of the community. I think we would all agree that making stores part of a community is important for a lot of retailers that have to compete with online stores; it was extremely important for Borders and they had been pretty good at it. I don’t know if greeters are as important to WalMart as community relations coordinators were to Borders. But if they are, then their elimination could mean that the vicious cycle is getting really bad at WalMart and—as is the way with vicious cycles—will only get worse. One reason I love what I teach and research is because many of the lessons are applicable not just to business but to life in general. During this time of the year, we often read and think about resolutions for the New Year. Here is a bit of advice to those of us who want to stick to our New Year’s resolutions: choose just a few things that really matter and make a 100% commitment; not 90% or 95%, but really 100% commitment. This advice comes from a case I taught in my service operations course last semester about Bugs Burger Bug Killers (BBBK), a pest extermination company. While all other companies in their industry promised to reduce pests, BBBK promised to eliminate them and gave a 100% service guarantee to boot. They said “if we don’t satisfy you 100%, we don’t take your money.” How much were their customers (hotels and restaurants) willing to pay for a 100% guarantee? A lot! BBBK charged ten times more than their competitors and made a ton of money. What is beautiful about this guarantee is that it was BBBK’s 100% commitment to it that allowed it to provide it while still being very profitable. The lessons from BBBK are easily applicable to other businesses. When companies make a 100% commitment to their values or principles, they are more likely to be successful in achieving them for at least two reasons: 1- 100% commitment prevents them from giving in to short-term pressures and make exceptions. 2- 100% commitment forces them to make operational decisions or innovations they wouldn’t have made otherwise. Let me describe these reasons using the following example from life. Say that one of the problems in your life is that you work too much and that you don’t spend enough time with your family. You know that this is bad for your and your family’s long-term happiness. So, during the next year you decide that you will dedicate your weekends to spend time with your family. 1- What do you do when there is an important project that is due Monday and by Friday evening you find out that you are way behind? Would you make an exception just this one time and work that weekend? I bet that without a 100% commitment, most of us would make this exception and many other exceptions like this and have short-term wins, like a project well delivered. But in the end, we will end up working most weekends again and lose in the long-term. We will probably regret all the time lost with our children. If we are tempted to give in to short-term pressures in the context of our families, imagine how easy it would be to give in to them in the context of business. Unless certain values/principles are practiced 100% of the time, people may be tempted to make exceptions. They may make bad or unethical decisions, especially if they work for companies that are constantly under short-term performance pressures. Making a 100% commitment to certain values or principles eliminates these exceptions and saves us from making decisions that hurt us in the long term. 2- When we know that we will spend all weekends with our family, our “work time” will be constrained. As a result, we will be forced to find ways to be more productive during the five days we spend at work. We will probably eliminate much of the time we waste surfing the web or hanging out in our colleagues’ offices and make lots of other decisions that make us more productive. We may become so productive that we may end up doing better both professionally and personally. This again applies so well to companies. In retail, for example, there are some companies that commit to offering good jobs to their employees. They pay higher salaries and offer more benefits than their competitors. Having higher labor costs forces these companies to innovate in ways they wouldn’t have innovated otherwise. As I explain in my recent HBR article, these retailers end up making operational decisions that are very different than their competitors. And in the end, they perform much better than their competitors. So that’s my two cents for New Year’s resolutions. Make a commitment and stick to it 100%. When I first started teaching at HBS I found the last class of the semester to be the most difficult. While many of my colleagues shared their life lessons or communicated big, important messages, I felt I didn’t have much to offer my students. So I used the last class to wrap-up the important concepts we had learned throughout the semester. But after my first two years, I started wanting to do more. So, as I did before almost every class, I knocked on the door of my great colleague Kent Bowen and asked for his advice. And as he always did, Kent started asking questions. Why did I want to do something different? What did I want to communicate? Why? And at the end of our meeting, Kent gave me a case about the life of Jai Jaikumar. After reading the case, I knew exactly why Kent shared it with me. The case described how Jai was saved by a shepherd woman after a tragic accident while climbing the Himalayas. And it provided an opportunity to communicate something I truly believe in: luck plays a big role in our success and success brings an obligation to serve others. Since 2008, I have been teaching this case on my last class. And thanks to Kent, the last class has become one of my favorite classes. I just taught the Jai Jaikumar case in my supply chain elective course. But this was not just the last class of the semester but also my last class at HBS. This summer, I am joining the Sloan School of Management at MIT. I am thrilled to have the opportunity to work with world-class researchers in my field, teach Sloan students, and have time to write my book. But I will miss the HBS classroom. Teaching at HBS was an incredibly rewarding experience for me. During the first years, my objective was simply surviving in the classroom. I can’t tell you how many bad dreams I had in which I did not know the material or I was not able to control the 90 bright students. I had nightmares about chaos in the classroom with students dancing, yelling, and walking in and out. Surviving in the classroom was a lot more difficult than I had predicted. Luckily, I had a great set of students and colleagues like Jan Hammond and Roy Shapiro who helped me get better everyday. I still have nightmares, especially in the beginning of the semester, about teaching. But my objective is no longer surviving in the classroom. Rather, it is sharing with my students my research, and most recently, my point of view on business and life. As I started connecting my teaching with my research, I began seeing my students as collaborators with my research. They challenged my ideas, offered alternate explanations, and asked great questions that forced me to think deeper about issues I was studying. I am grateful for all that they taught me. As I started sharing my point of view with students, I began having big hopes. I hope that my students will be more likely to start or join companies with strong values and priorities and make operating decisions that are good not just for profits, but also for employees and customers. I hope that my students will be less likely to give into the temptation (or pressure) to make short-term decisions at the expense of their employees and keep focusing on the long-term. I hope that my students will define their success not just by how much money they make, but how they made the world a better place by their presence. It was an absolute privilege to take part in the development of leaders who will make a positive difference in the world. Thank you HBS for the opportunity! And thank you my students this term who made my last class one I will never forget. New York Times had a recent piece about how retailers like Dollar General, JC Penney, Old Navy and Wal-Mart are increasing clutter to improve sales. So to get their customers to buy more, these retailers are adding more inventory and more variety to their stores, according to the article. I think this is a really bad way to increase sales. Yes, these companies will see a short-term increase in their same store sales. You give customers more choices, stuff the store with inventory, and they will buy more. And yes, Wall Street will probably love this. The increase in same store sales growth will make the analysts think that these retailers are actually doing something right. But of course, the analysts will miss that since this sales increase comes solely from more inventory or variety increase, it cannot be sustained. This is just a one-time increase in sales. You cannot keep on adding more and more inventory to the store. More importantly, this is a bad long-term decision. It does not benefit employees because their operating environment has now been made more complicated. It will not benefit store operations because employees will be less productive and make more errors when their stores are cluttered. It surely does not benefit the environment because this will increase waste from obsolete inventory. And it probably doesn’t even benefit the customer. Store clutter leads to customer confusion. Some customers even responded on the New York Times article’s comment section saying they regretted buying stuff they didn’t need. Here is an idea. How about offering fewer but better products and investing in employees so they are knowledgeable about these products and they can educate their customers about the value they are receiving? This is exactly what retailers like Trader Joe’s, Mercadona of Spain, and Costco are doing. And you want to know how they compare to their competitors in terms of sales? Not too bad! Trader Joe’s sales per square foot is more than double the supermarket average. Mercadona’s is more than 50% higher than that of their largest competitor, Carrefour. Costco’s is more than 30% higher than that of Sam’s Club. Today, I also learned about another retailer that has the same strategy: Patagonia. I met the Director of Advanced Research and Development at Patagonia at a panel I was moderating at HBS Retail and Luxury Goods Conference. When someone asked a question about how Patagonia responded to the economic crisis, he mentioned that they did so by cutting their product variety in half. In half! It took them 18 months to do so, but their customers loved it, their employees loved it, and their performance showed it. Of course, one reason Patagonia was able to do this was because they had invested in their store employees so that their employees could intelligently talk to the customers about the products they carry. The panelist also mentioned that Patagonia’s salespeople are taught to encourage customers to only buy things that they need—not waste resources on stuff they don’t need. Why would they do this? Because this is aligned with their mission: Build the best product, cause no unnecessary harm and use business to inspire and implement solutions to the environmental crisis. Kudos to Patagonia! Last week, many of my students forwarded me the New York Times article about female professors at MIT. The article pointed out how difficult it is for women to get tenure—judging from how comparatively few do—and pointed out what universities such as MIT are doing to counteract the bias against women. My response to all this? Yes, there is compelling evidence that there is bias against women and it’s great that universities are acknowledging it. But for those women who choose to have families, there is an additional structural problem with the tenure system in academia, which I believe is more to blame than bias. Unless universities address this structural problem, things will not improve for women seeking tenure (nor for students seeking tenured women professors and advisors). At most universities or professional schools, the tenure clock is seven to ten years. During this period, you have to establish that you are the leading scholar in your field. “Leading scholar” has different meanings at different schools. Some schools care most about the number of publications in good journals. Some care most about one big idea that pulls all your work together. Achieving either of these in a race with time is a lot of work. You might wonder how quality of teaching affects getting tenure. Unfortunately, at most universities and professional schools, teaching (good or bad) has no impact on getting tenure. Once you get tenure, the race with time is over or at least the pressure is gone and you have job security for the rest of your life with rare exceptions. Let’s just think about this system for a moment. Which business academic or consultant would ever recommend to a high performance company that they should give their employees job security for the rest of their lives—not to mention considerable power over the careers of others—based only on what they did in their twenties and thirties? Not many, I imagine. But of course, this is a completely different topic and others have already discussed the pros and cons of the tenure system (See Steven Levitt’s blog). Of course, there are exceptionally talented women who can handle all the domestic activities, put in correspondingly fewer hours on their academic work, and still out-research and out-publish their peers. But they are rare. Most of us are more likely to lose out one way or the other. I know many women who are tenured or on the way to getting tenured who deeply regret being unavailable during their children’s formative years. They know they will never make up for all the time they took away from their children. I also know of many women who chose to spend time with their children and did not get tenure. Whose problem is this? Is this choice forced on women by the biological facts of life? I don’t think so. Rather, I think it’s a bad system that can and should be fixed. The sad part of this problem is that our children are young for so short a time. My own mother constantly reminds me that our children are lent to us for at most 18 years so we should make the most of it. Careers, on the other hand are very long. So how should universities think about this structural problem? As the New York Times article mentioned, most respond by adding one extra year to the tenure clock when you have a baby. But is one year enough? Why not two years or five years? If a person can produce tenure-worthy work in her forties or fifties, say, why should she already have been thrown off the tenure track? Conversely, if it is deemed unlikely that anyone could produce tenure-worthy work in her forties or fifties, what are we expecting from all those faculty who were given tenure in their twenties or thirties? Wouldn’t that have been just the time to assume they were washed up and fire them? What are the societal implications of highly educated women opting out of the workplace to care for their children, or conversely, outsourcing parental responsibilities to pursue careers that won’t wait for them? I would love to hear from others on this. There have been so many things to write about the last few weeks but so little time to do it. I moderated a panel on work-life balance a couple weeks ago at HBS and I hope to write about it during the next few weeks. But now, while it’s fresh on my mind, I want to write about high levels of product variety. On February 23rd, the Wall Street Journal reported about proliferation of toothpaste SKUs. According to the article, in January 2011, there were 352 distinct types or sizes of toothpaste at retail stores. When one examines the functions, flavors, and sizes, there could actually be more than 2,000 combinations of toothpaste! The functions include whitening, plaque prevention, gingivitis prevention, cavity protection, tartar control, long-lasting fresh breath, and baking soda & peroxide. The flavors include brisk mint, frosty mint, cool mint, crisp mint, “cinnamint”, vanilla, watermelon, and bubble gum. Toothpaste comes in gel or paste and there are multiple sizes. So maybe 352 is not that bad after all. But 352 is utterly confusing to consumers. How on earth are we supposed to know exactly what we need when there are so many choices? And the costs of this confusion are well documented in the marketing literature. But as an operations professor, what worries me the most is all the waste associated with high product variety. Clearly there are manufacturing costs associated with high product variety. But there are also inventory related costs. While it is easy to forecast consumption of toothpaste, it’s really hard to do so at the item level when there are hundreds of different types. The difficulty of forecasting translates into poor management of inventory. And there are costs at the store level (I wrote an academic paper on this topic). High product variety drives store employees crazy because it complicates their operating environment. 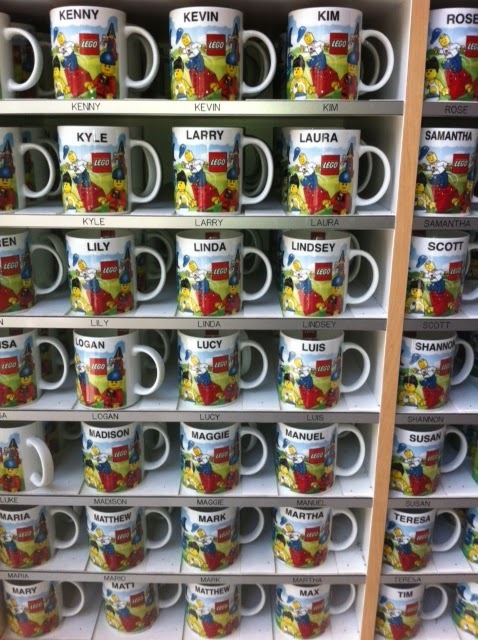 Yes, maybe some people are excited to walk out of the store with a mug that shows their name. 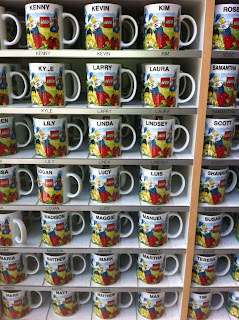 But with the proliferation of names in a multicultural world, how many of the customers will actually be frustrated that their name is not in there? Speaking of my family, none of our four names were available. Maybe we are just a weird family, but I imagine there are many families that visit Disneyland that will encounter similar disappointment. I have no idea how much a machine that does on-demand printing would cost, but the operations junkie in me kept thinking that there must be a better way to manage this situation. I have two children and I teach at Harvard Business School. If you ask me which of these two things is more challenging—raising children or teaching at HBS, my answer would be pretty clear. To me, raising children is far more challenging. And teaching definitely did not come easily to me. Ask my first group of students from 2002 and I’m sure they’ll remember all the struggles I had as a first-time teacher. But what made teaching less stressful was the expectation that it was okay to make a lot of mistakes as a rookie. What is my objective as a parent? I feel that optimizing my children’s happiness should not be my objective. My objective should be to help shape their character. There are certain traits that I would love my children to have such as kindness, generosity, responsibility, hard work, curiosity, and honesty. But shaping their character, or at least trying to shape their character at this age is not always fun; I often find myself trading off my children’s short-term happiness with discomfort and stress. As a working mom, who doesn’t get to spend all her time with her children, I sometimes wonder what I am giving up as a result of my choice. How high should my expectations be? I would never want to take away the gift of high expectations from my children. I would love for them to excel at what they do. But how do I make sure that I don’t put too much pressure on them? And when setting expectations, how much weight should I give to the outcome, such as getting all A’s, or on the process, such as working X number of hours a night. How much should I shape my children’s interests? On the one hand, I would love for my children to pursue what is exciting to them. I know that if they find something about which they are passionate, they will put more work into it and will be more likely to be good at it. This will improve their confidence and probably make them happy. But on the other hand, I feel that my husband and I might have a better idea of what our children can be really good at. Perhaps this is because of my own experience. I used to love basketball as a kid. I watched my father play and then coach basketball and I absolutely loved the game. So at the age of 10, when my father insisted that I play volleyball instead of basketball, I was heartbroken. According to my father, volleyball would be better for me. While I didn’t like his choice at first, I started loving volleyball after I became good at it. Should I follow my father’s parenting style? How busy should my children be? A lot of kids nowadays start participating in extracurricular activities and taking private lessons at young ages, even as toddlers. And they are always busy going from this activity to that activity. My boys are 3.5 and 5 years old. The younger one goes to daycare all day long and the older one goes to pre-K. When they are not at school, my boys just hang out. During the weekdays, the four of us spend a lot of time at the dinner table (frequently with other guests) and reading books. During the weekends we run errands together, talk, play silly games, let them watch some TV and yes my husband and I go crazy watching them fight or call each other names. I am sure things will change as they get older and activities will have to be added to our calendar. But am I doing the right thing right now? Am I taking away opportunities from my kids?